WASHINGTON, D.C. – In response to the GOP replacement plan for the Affordable Care Act, NETWORK Lobby for Catholic Social Justice announced its 10 Commandments of Healthcare. Read the 10 Commandments and letter to the House Ways and Means and Energy and Commerce Committees. 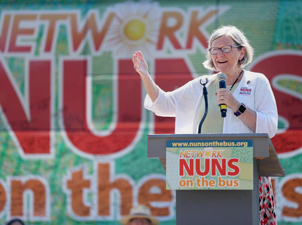 “NETWORK Lobby for Catholic Social Justice has advocated for healthcare for all in our nation because of our commitment to the dignity of all people. We are called to care for those who suffer, and we are challenged to support all of our neighbors so they can realize their full potential. As part of this mandate, we have an obligation to protect populations who have historically been discriminated against because of their race, gender, or socioeconomic status. NETWORK also joined the Washington Interreligious Staff Community priorities for faithful healthcare reform. You can view their press release with quotes from 14 faith leaders from various traditions online. This entry was posted in Front Page, Healthcare on March 7, 2017 by colleen. As you know, the ACA is not the “end game” to assure affordable, quality, accessible healthcare for ALL Libing in the US. I applaud you for your fantastic work supporting the poor and most vulnerable among us, but urge you to support a publicly funded “Medicare for All” single payor system as the only long term solution to assuring healthcare as a right for all living in this most Prosperous nation in the world. I made a donation to your work in this, International Women’s Day and thank you and the other sisters for your tireless work and advocacy. I personally know of people who were able for the first time to get health care through the ACA. Please continue with all the good opportunities given for the poor and middle class.